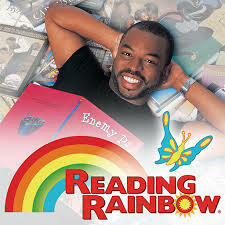 That delightful children’s series which encouraged reading, hosted by LeVar Burton and aired on PBS from 1983-2009? Burton has just launched a Kickstarter campaign to raise one million dollars to create an online version to expand the program’s reach. When Reading Rainbow went off the air in 2009 Burton bought the rights to the show and its name and created the company RRKidz, which produces a Reading Rainbow tablet app. The Kickstarter campaign is raising funds to expand on that app, making it available on the Web and updating it with special tools for teachers on a subscription basis. The campaign has gotten off to a very impressive start: it has already exceeded its pledge goal, with 29,145 backers having already pledged over $1,295,000. With 34 more days to go on the campaign, the Reading Rainbow team is hoping to raise additional funds to meet more ambitious production goals. Read more about Burton’s efforts here and check out the Kickstarter campaign here.